Albert Park and Albert Park Lake are situated in the City of Port Phillip, Victoria, Australia, 3 km south of the Melbourne CBD. The park encompasses 2.25 km² (555 acres) of parkland including Albert Park Lake and provides numerous ovals, sporting facilities, the Albert Park Public Golf Course, a 5 km walking track around the lake, and the Melbourne Grand Prix Circuit. It is bordered by Albert Road, Queens Road, Fitzroy Street and Canterbury Road. 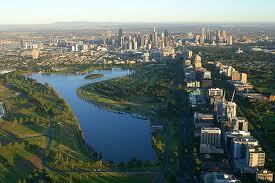 Surrounding suburbs include Albert Park, Middle Park, St Kilda, Melbourne and South Melbourne.